Newport Back Bay is one of the better spots to run in the Newport Beach area, especially if you’d like some variety. 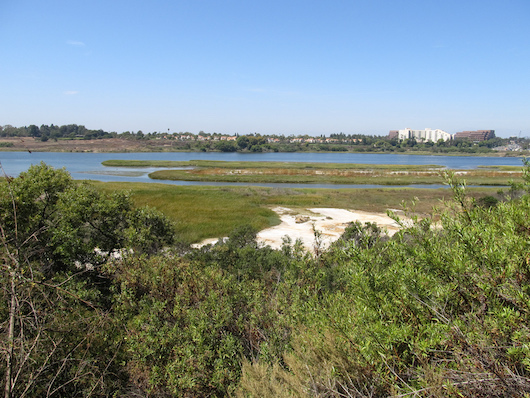 This nature preserve connecting the Upper Newport Bay and Newport Harbor is a popular 10.5 mile loop. It’s paved and relatively flat, with great views of the water much of the way. The south side, about 6 miles up to the Peter and Mary Muth Interpretive Center, is the nicest part of the path. There back 3 or so miles of the loop on our map, which is on the road, is not as pleasant. Some segments of the trail offering a dirt path alongside. There are some dirt paths that run along the cliff that provide a bit of variety. Parking: Science Center, Newport Dunes, Interpretive Center, and along East Bluff Drive.